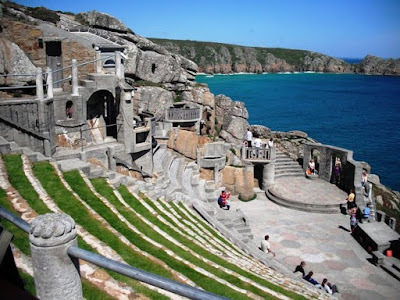 the unique Minack Theatre in her home's back garden in Cornwall. IN his continuing search for the more weird and wondrous in this world, David Ellis says that it looks like a typical open-air live theatre in Greece or elsewhere in the Mediterranean. But in fact this is at a little village called Porthcurno 6.5km from Land's End in Cornwall in England, and has been home to local and visiting theatre companies since the early 1930s. The theatre was the brainchild of Rowena Cade who had built a home for herself and her mother on Porthcurno's Minack Point just after the end of World War I, and when a local theatre company was looking for an ocean-side setting to stage Shakespeare's The Tempest, she had offered her home's garden with its appropriate open-sea background. Then she and her gardener, Billy Rawlings spent weeks hauling materials from the rocks and beach below to create a stage and seating – so successful the play being, that Ms Cade spent every winter until her death in 1983 aged 89, improving and developing the site with the assistance of gardener Rawlings and a friend, Charles Angove. 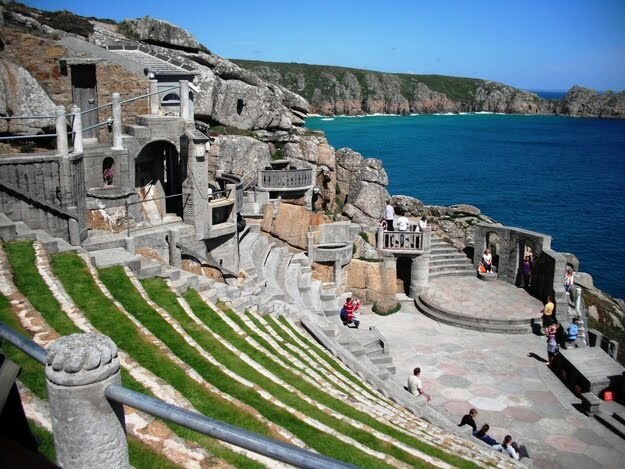 Today up to 20 plays are performed at the Minack Theatre every summer by UK and visiting overseas companies, with an average 80,000 a year coming to watch – and an inquisitive 100,000 more paying to simply have a sticky-beak of the unique site.